Preschool 2 is a time of wonderful transitions. Increased language and physical skills, along with developing friendships and curiosity, provide the basis for a rich and inviting curriculum. Children continue to explore centers (drama, block, art, etc.) through choice time, and work on small and whole group activities. Circle time provides expanded opportunities for both listening and presenting, along with building math and reading skills. 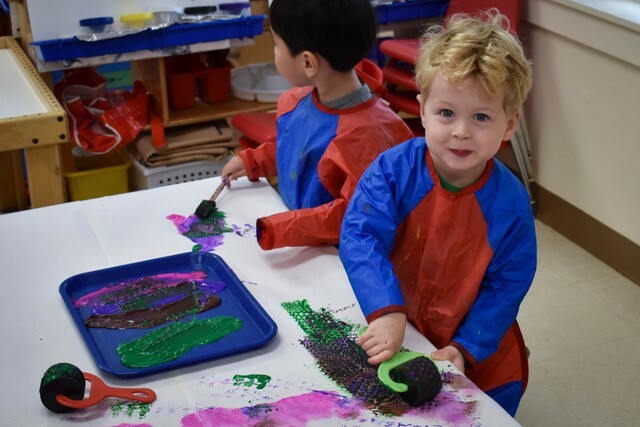 Through play in hands-on activities rich in science, math, literature and art, children build skills to prepare them for our Pre-Kindergarten and PreK/Kindergarten programs and/or public and private kindergarten. We are preparing our CHDS Preschool 2 students for Pre-Kindergarten and Pre-K/Kindergarten. Literacy: Reading “Eating the Alphabet” and sorting foods into fruits or vegtables. Math: Graphing the Red Light, Green Light and Yellow light foods in our lunch box. Science: Using our five senses to identify different types of foods. Art: Painting still life of fruits and vegtables. Drama: Shopping in our Preschool 2 supermarket, making grocery lists and working the cash register.